Kahotan's Blog | GOOD SMILE COMPANY Figure Reviews | The Bigger of the Fire Sisters: A 1/8th Scale Karen Araragi!! The Bigger of the Fire Sisters: A 1/8th Scale Karen Araragi!! So once again I, Shuutarou Hirase from the planning team, will be taking over the blog! The last time I was on the blog, I reviewed Nendoroid Kurisu & Mayuri : Cheerful Ver. It’s been quite awhile since then! But what will I be taking a look at today…? Two prototype cases next to construction machinery catalogs! This must be one huge figure!! Let’s take a look!! It’s the bigger of the twin sisters!! This lovely figure of Karen-chan debuted at the previous 2012 Summer WonFes, but now she’s fully painted! From the popular light novel and anime series ‘Nisemonogatari’ comes a 1/8th scale figure of the girl who was stung by a bee, Karen Araragi! The figure is based on the cover illustration used for the 1st volume of the Blu-ray & DVD: “”Karen Bee: Part 1”, which features Karen wearing her trademark yellow jersey. Even the huge road roller in the illustration a part of the figure, and the valiant pose has been faithfully reproduced in figure form – Karen truly looks like a ‘hero of justice’! The road roller adds an incredible presence to the figure, but first I’m going to take a closer look at Karen-chan herself! The expression suits Karen-chan’s active personality nicely – the confidence in her eyes would put most men to shame! The teeth you can just see at the top of her mouth are also a very cute feature! Her side ponytail blowing in the wind! The unique kinks and twists in her hair have also been faithfully preserved in the figure! The way her hair is blowing about adds a really dynamic feeling to the figure! She also has the egg-shaped hairpin that matches with her sister, Tsukihi-chan’s hairpin! The hair sticking up at the front (which has always been passed down in the Araragi family) also looks great on the figure! This figure is great at giving subtle glimpses like this!! A beautiful S-shaped body-line from her back to her hips! One of the most amazing things about this Karen-chan, is that even though she is wearing lots of clothes, you can still make out her body line clearly! Even though the ends of the clothes are rather baggy, there are contrasting areas that are very tight which keep the shape of the body very clear! Karen-chan is always exercising, and this little section gives us a teasing look at her shapely stomach! You can even see her belly button in the little gap between her tank top and stomach, it must have been very hard to sculpt that… it’s also very hard to photograph, but it’s there!! The hip area looks fantastic!! As I said earlier, even though she is wearing fairly baggy clothes, you can still make out her body so nicely! It’s all thanks to the amazing sculptors that we can enjoy Karen like this!! On New Year’s Eve last year Nekomonogatari aired, where we found out that each morning Karen jogs a full 42.195km marathon with ease! These legs are truly amazing for more than one reason! The pants and her leg are made as separate parts in the sculpting process, so you can see her fit, shapely legs all the day down into the baggy shorts! 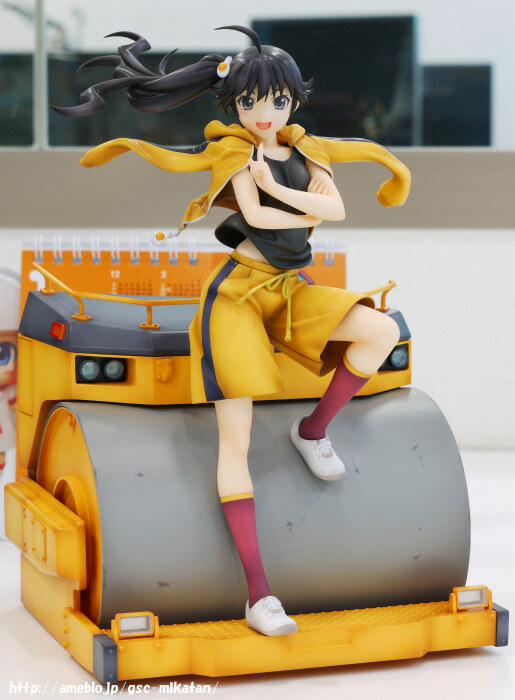 The figure is based on the cover illustration of the 1st volume of the Blu-ray & DVD: “Karen Bee: Part 1” included this impressive “road roller” which has made its way into the figure as Karen’s pedestal! Definitely one of the most unique figure stands ever! It has a really heavy look to it! The indicators and headlights are both made from clear parts, and the detail put into the rest of the machine is incredible – from the hooks to hold up wires and other things to the bolts scattered throughout the design! All the parts where two pieces of the roller connect together also have their edges painted a slightly darker color. It looks just like a real piece of heavy machinery! The road roller has clearly been hard at work! You can see by all the scratches and dents along the roller that it has been used on countless occasions. The step on the front is most likely a safety device, and even that has been sculpted so intricately! Ooh! She looks just like a super hero from this angle!! The shape her body forms really is lovely! Just look at how her hips swing into it! The jersey blowing about has quite a different feeling when you look at it from the back – it gives the whole figure such a dynamic feeling, as if the wind really were blowing across her! The reverse side of the roller is flat, for ease of display! It was a a little too much to include an entire road roller, but the figure does include everything you could see on the original illustration. By making the back flat like this, you can easily put her on display up against a wall. The road roller stand is easily one of the most stable pedestals ever, but if you put it up against a wall it’s even safer! The flat end also saves some space seen there are no extra pieces sticking out at the back! Anyway, that’s all for today! The next blog will be on the 15th of January, which is Tuesday next week. ‘Nutty’ from the production team will be writing that blog!